The bold and the beautiful come together in this art deco ring from Apples of Gold. 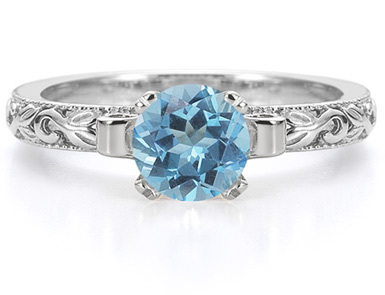 A solitaire blue topaz gemstone brings the color of a bright blue sky to this piece. Fashioned with a round cut, the gemstone beautifully reflects light for a gorgeous shimmer. The 6mm blue topaz gem is secured by a four-prong setting of silver that also features two coils of the radiant white metal on either sides. This leads to a precisely crafted band of silver, true to the art deco style. We guarantee our Blue Topaz 1 Carat Art Deco Ring in Sterling Silver to be high quality, authentic jewelry, as described above.